Aurora’s students aren’t shy about expressing their views of the world and depicting all facets of the human experience through their art. So what if the subject matter can turn a little dark at times? In the end, it is all about the experience. This is the view of student-curators who spent the early part of this week putting the finishing touches on a joint art exhibition at the Aurora Cultural Centre hosted by Grade 12 art students of Aurora High School and Dr. G.W. Williams Secondary School. 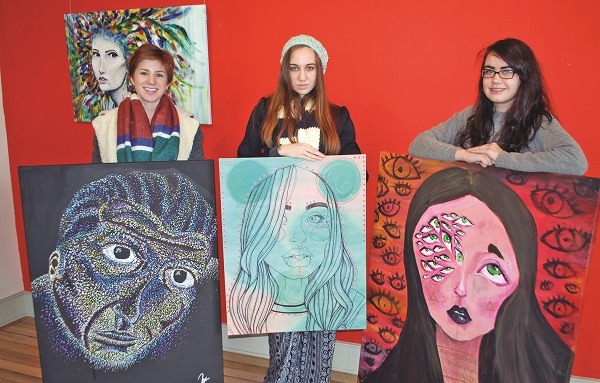 Avery, Madeline and Maddy took on the curatorship of their school’s show with an eye to including as much of their fellow students’ work as possible. All their styles are so different, says Madeline, which made the task a bit more difficult. “I was really excited about this show because I honestly believe that everyone is actually very talented,” says Maddy. “Once you get to the art course in Grade 12, the only people left are the ones who actually care about art because you don’t need arts credits anymore. You’re not taking art because it is easy, you’re taking art because you like it. The art selected will also show the community what is on the minds of students as they prepare for their lives post-high school. This interest in “society, mind, and psychology” is evident looking through the paintings, sketches and sculptures that fill the exhibition space. One of Avrey’s pieces, for instance, is called “Eyes”, depicting a kaleidoscope of vivid green eyes emanating from a figure inspired by the facial features of the singer F.K.A. twigs. A similar theme is followed by Maddy, who takes on the fashion industry in her piece called “Sixes and Sevens.” That, she says, is a way to express confusion, being distraught, and not really sure what is going on in the world around them.